Let’s start with lesson 20, containing proverbs 191-200. Literally: to get everything out of the closet. The meaning is: to do everything you can. For example: ik moest alles uit de kast halen om die baan te krijgen. I had to do all I could to get the job. Literally: to get the old horse out of the stable. The meaning is to dig something up again. Literally: to have the ropes in the hands. The meaning is to be the boss. The word ropes refers to the reins to direct a horse (in Dutch: teugels). You can use the proverb also as “de teugels in handen hebben”. Literally: to guide someone around the garden. The meaning is to cheat someone. Actually the word “tuin” here, is not the plot of land next to your house, but the meaning it had in the middle ages: a fence. So guiding around the fence, means that you don’t give access to the truth. Literally: there will be sunshine after the rain. The meaning: after a bad time, there will be always a better period. Literally: not to be seen in fields or roads. You can use the expression when someone disappeared. You can also use it in combination with “iemand”: “in geen velden of wegen was er iemand te bekennen” and then it is like the English equivalent “not a soul was to be seen”. Literally: to move on to a steep surface. A better translation of “hellend vlak” is actually a “slippery slope”, and refers to a certain way of logic in a debate. It is used when someone suggests a causality (without any ground) or exaggerates a correlation. For example, if raising the pensions appears to be good for the economy, why we do not double the pensions, it would be even better. Literally: to chase someone’s tatters. The expression is used, when someone needs to be instructed to work harder. Usually when a person is lazy by himself, and only does something when you continuously remind him about his duties. Then you say: “je moet hem achter zijn vodden zitten”. Literally: to know how the fork is attached to the stem. The meaning is that one understands perfectly the whole situation. Literally: a fox may lose his hair but not his cunning. The meaning: people may get older, but they rarely change. The expression is often used to talk about someone who did something wrong in the past, as a warning that it may happen again. Get everything out of the closet to finish this course. I hope I don’t need to chase your tatters. 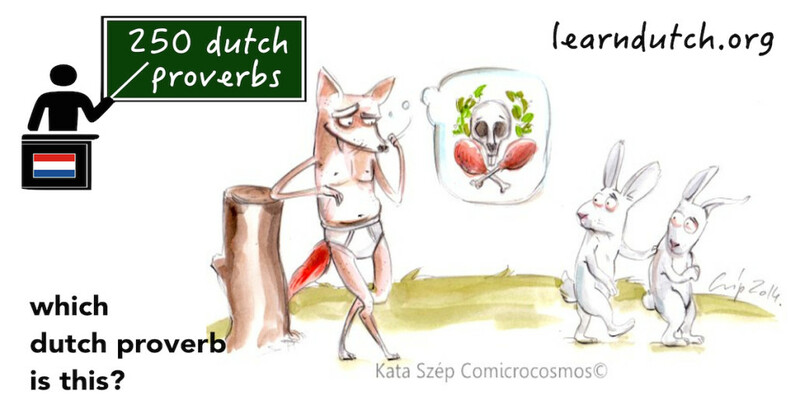 See you back in lesson 21 of 250 Dutch Proverbs.